Listen to a podcast conversation with three members of the original Cassini science team in a special episode in honor of the Cassini mission, which came to its dramatic close on September 15: Jeff Cuzzi, the mission’s interdisciplinary scientist for rings; Dale Cruikshank, an astronomer and planetary scientist studying Saturn’s icy moons; and Chris McKay, a planetary scientist and one of the original collaborators on the Huygens probe – all three from NASA’s Ames Research Center. 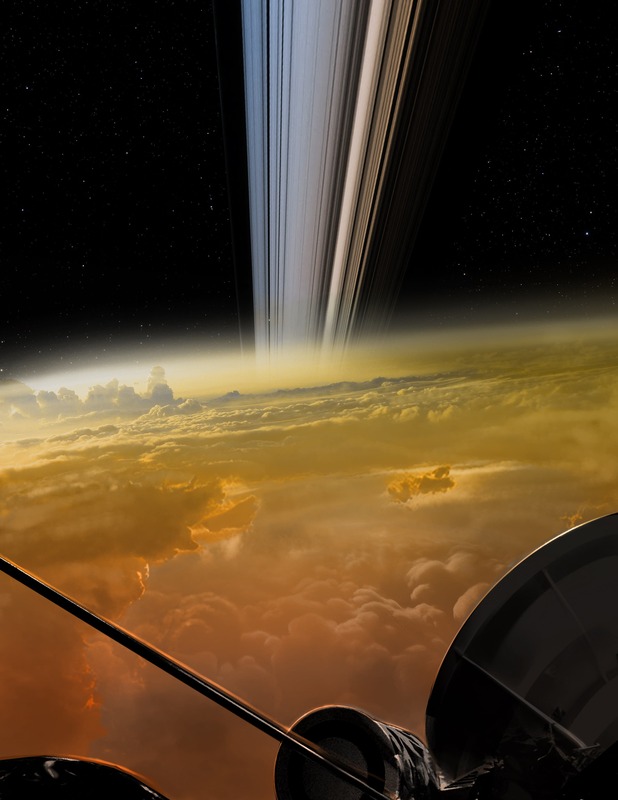 Here are three samples of their farewells to Cassini and what captured their imagination as scientists pursuing the search for life in our Solar System. My farewell to Cassini would be, “Thank you for the revelations of Titan's liquid methane lakes, and even more so for the organic-rich geysers on Enceladus,” because that's given us astrobiologists a clear direction on what to do next, and we're doing it. The highlight for me was the opportunity to study up close and in detail one of the other satellites of Saturn, which we have known for about 300 years, is really very interesting. In fact, the study of this satellite, which is called Iapetus, goes back to the Pioneer space mission — which was operated out of Ames, by the way — in the '70s. And then we got some more information with Voyager in the '80s. But now we are able with Cassini to look at this very strange satellite up close. First of all, it's fairly large. Smaller than our moon, but still fairly large. It's mainly made of ice. But one of its surfaces, one hemisphere, is almost entirely coated with some kind of black, reddish, low-reflectivity material. What is that stuff and where did it come from? With Cassini and the VIMS instrument that I work with, as well as some other instruments, we've come to an understanding that this is some kind of an organic, solid material, complex organics. We can measure its spectrum and its distribution on Iapetus. We now even know where it came from, the dark stuff. 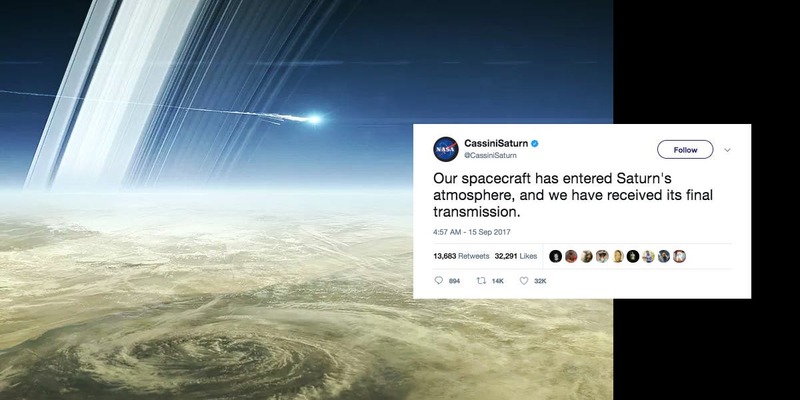 Because it turns out that another of Saturn's moons has apparently been hit by some projectile, some comet or asteroid from space, and has liberated a huge amount of dust. This is the outermost large moon called Phoebe. And that dust has spread itself into a gigantic ring, much larger in size than the rings we're more familiar with. The dust from this ring slowly filters in towards Saturn. As it does, some of it is intercepted by my favorite satellite, Iapetus, and Iapetus gets a coating on one of its hemispheres. So, we now know where this dust comes from. We even have a pretty good idea of how thick it is, which is about 10, 20 inches. It's not much. And it's still falling. It's still getting dusty on Iapetus. Now from the VIMS instrument study, we know that it's made of complex organic material. This then feeds back into this whole issue of the organic content of the solar system, and must, in some way that we haven't yet, I think, uncovered, relate to the organic material that's on Titan and Enceladus, and the other objects that we still want to explore in greater detail. Host: Very cool. Could you explain a little though? What do we know about this organic material? That doesn't mean it's necessarily related to life. Right? Dale Cruikshank: That's correct. In fact, it almost certainly isn't. We've found in space, both in our solar system, in our galaxy, and in other galaxies far beyond, that carbon and hydrogen like to get together and make the rudimentary material that we would call organic. So, the term organic doesn't necessarily imply the origin in any relationship to life itself. It's a common process throughout the universe, apparently. Some of it has happened in our neighborhood and what we see on Iapetus, and certain other objects in the Solar System is evidence of that material that has formed in abundance and has been spread around and accumulated in interesting ways. Since you mentioned the rings of Saturn, let me say a few things about what we have learned. Saturn's rings are really like a vast dynamical laboratory. It's a big, giant particle disk where the particles interact like molecules in a fluid. So, we treat it like a fluid, collisions and such. So, it's a great way to understand the processes by which our planet formed from the disk of particles and gas that originally surrounded our sun. It's a laboratory for us to study that. All those processes in the rings probably happened in one way or another in our own forming solar system and in other forming solar systems where we see all these thousands of exoplanets. The other thing we learned was that Saturn's rings are changing before our eyes. This fluid flops around and moves and changes. We see things colliding and recreating as we watch. That's been fascinating. In fact, the whole origin of Saturn's rings, we think, it's whether they formed in the last couple hundred million years is a hot topic these days. That is around the age of the fish on Earth or more recently.